Strategy game is the original Loquiz. The idea is to get from the start to the finish with as few steps (answers) as possible. You can think about the Strategy game as an outdoor life-size board game. Just like in Snakes & Ladders, there are shortcuts (ladders) that take you many tasks forward and fallbacks (snakes) that take you back. In Strategy game, it is not about the luck but about planning and wisdom. Tasks score is ignored, instead penalty points are used. 1) Add tasks You need enough tasks in case you are building a strategy that does not expect players to visit every location. 2) Assign locations to the tasks – location-specific tasks have locations already, now you need to add locations to the rest of the tasks as well. Do it on “Locations” screen. 3) Order the tasks and set the finish point – as players are roughly following task numbers, it is worth reordering tasks so that there is a sensible track. It is worth keeping locations close by also close in order. You can reorder tasks and locations by dragging them on “Location” page. 4) Create strategy or scenario – with strategy you basically define where do the players go next, if they answer the task correctly (green line) or incorrectly (red line). You can do it on “Strategy” page. 5) Modify game’s settings (game name, welcome text, finish text, time limit, language, overwrite task timers if needed, limit hints and change pin settings). 6) Modify the start field. By default start field will be given to teams randomly (from 1th to 6th task). But you can change it and assign teams the same start field. To do it, go to “Configure” screen and deactivate “Random from 1 to 6” field. On “Configure” page you can limit fast forwards (open task now). It sets how many times tasks can be opened immediately without going there. Note that if task is not accessible, limiting fast forwards too much may break the game, so this is very much recommended feature to have in a game. Strategy is a rule set that defines for every task what task opens next depending on if the previous answer was correct or incorrect. Green lines mark correct answers and red lines incorrect ones. To build a strategy you will define for every single task in your game what point activates next if the answer was correct or incorrect. You can change the strategy under “Strategy” tab while creating/editing the game. Default strategy – every time players answer correctly they can move on to the next task. Every time players answer incorrectly, they move back to the previous task and have to answer it again. Great to use to create tours. Simple strategy – every answer (correct and incorrect) just takes players to the next task. A little bit more complicated strategy – correct answer take players to the next task but incorrect answer opens the same task again and again until they get it right. You can build whatever strategie that comes to your mind, e.g. correct answer takes you forward several steps, incorrect answer back several steps. You could make people answer wrong, to go back and then jump forward. You can make players to start from the last task and work their way to first field (finish). You can make correct answers take people backward etc. If you know how to set up that kind of game, it will receive great feedback from the players! a) Basic ideas is that every answer in a game gives one penalty point (tasks’ scores are ignored). It does not matter if the answer was correct or not. Less points is better, so find the best strategy. b) In case team does not make it to the finish (time is up), one penalty point is added for each task players are away from the finish (if finish is 50 and you are at 35, you would get 15 penalty points). In this case strategies are not taken into account. Steps to finish is visible from the Menu -> Score. 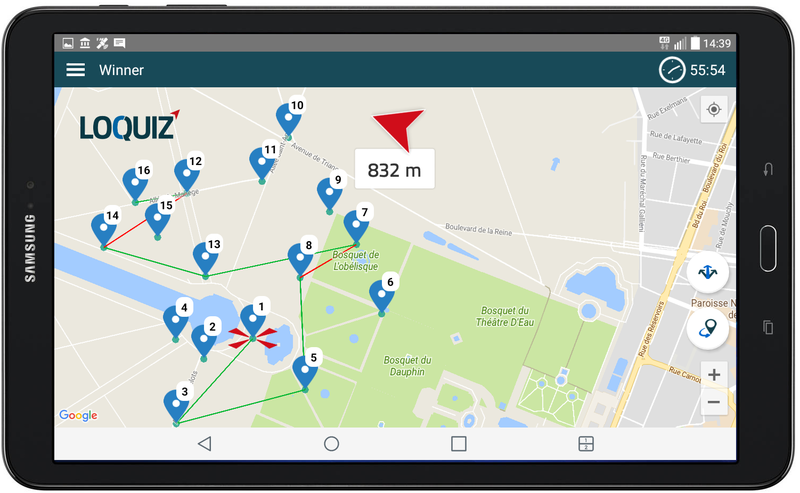 c) As you can let players open the next task from distance (without going to the actual location) – open task now, one penalty point is added for every time player uses this feature. Sum of all these items listed above form player’s score. Team who has the least points, wins. All locations are visible on the map until the end of the game, on top of each location task’s order is shown. In the beginning of the game players toss a virtual dice to get a random start field (from 1 to 6 task). It is also possible to change settings and make all teams have the same starting field (specify field). One task can be opened at a time. Red arrows show the task that can be answered. Next task will be determined by the strategy and correctness of the last answer. Players can actually see the strategy map that you create with Loquiz PRO (see screenshot below). Players can plan their route in the game (Menu -> Create strategy). In strategy view they see where each answer (correct and incorrect) will take them. They just do not know what the content of the tasks are. So it is possible to plan the shortest route to the finish. Players can plan and mark it down, how they want to answer each task by clicking on the task numbers: 1 click -> correct answer; 2 clicks -> incorrect answer. 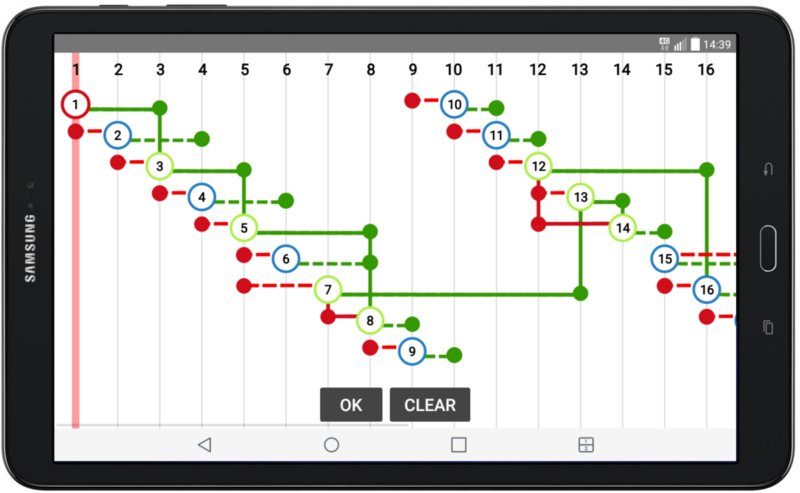 According to the strategy, automatically colourful lines will be drawn in strategy view between the tasks to visualize strategy chosen by the players – correct answer (green line), incorrect answer (red line). Players can also use fast forwards (Open task now) functionality – this will open the task immediately without going to the exact location. But when using it one penalty point will be added. To use it, players need to start the game, open main menu and click “Open task now”. Strategy games ends when teams go to the finish field. Meaning that they have carried out the strategy, finish task is answered correctly (no answer and survey task answers are always considered correct) and they are physically at finish location. Then finish message is displayed. Alternatively when time runs out, all the pins disappear from the map and only finish pin stays visible. Finish message is displayed when team goes to the finish location. Limited areas where tasks locations overlap each other. Start field is by default random (1 to 6), can be modified. Task score is ignored, penalty points are used instead. In the beginning of the game, score = steps to the finish. All tasks stay visible on the map until the end of the game, also when they are answered. Above the pins task order is shown. Players can open tasks without going there – fast forwards (open task now) functionality. Players can plan their strategy, strategy lines (green and red) appear also on the map. Navigation arrow is always visible on the map and guides players to the next task. Tasks can be answered several times (if answered incorrectly). Possible to set a limit. Unlike other games, in strategy main aim is to answer as few tasks as possible (team who have the least points wins). In this game type players will actually skip some of the tasks. Snakes and Ladders type of games. Important to remember: check that locations are accessible, or do not limit “open task now” feature.